Is the Tapioca about to join Sony's trio of handsets? The upcoming Sony Xperia Tapioca has appeared in a couple of photos, showing off the budget handset in all its glossy, black plastic glory. We first heard reports of the Tapioca way back in January when some less than inspiring specs were leaked. 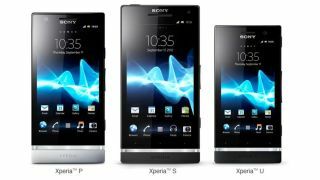 Now images of Sony's budget handset have made their way onto the web, with the first appearing on German site TechBlog. The Tapioca appears next to the Sony Xperia S and you can see the dainty handset has taken some styling notes from the HTC Wildfire S.
The second image comes courtesy of Russian site Mobile Review, which shows a prototype Sony Xperia Tapioca sporting the same design, but oddly branded in the Sony Ericsson livery – expect this to say Sony when it's released. In terms of what you can expect from the Xperia Tapioca, don't get your hopes up. Reports suggest it will sport a 3.2-inch display, 800MHz single-core processor, 512MB of RAM, 3MP camera and Android Ice Cream Sandwich. This will put the Tapioca up against the better equipped Huawei Ascend G300, BlackBerry Curve 9320 and rumoured HTC Desire C / Wildfire C – so Sony better keep its price low if it wants to stand a chance in the crowded budget market.